If you have several functions you would like to adjust the velocity for at the same time, you can use the Set Ease for Multiple Parameters dialog box. It allows you to apply the same velocity parameters to all the selected keyframes in a same frame. 1. In the Timeline view, select a keyframe on one or many layers. Only the first selected keyframe will be considered when using the Set Ease For Multiple Parameter function. If many keyframes are selected on a same layer, the ease values will be applied only to the first one and the rest will be ignored. 2. In the Timeline view,right-click and select Set Ease For Multiple Parameters. In the Timeline View toolbar, you can click on the Set Ease For Multiple Parameters button. This button is available in the Timeline View toolbar's extra buttons. Refer to the chapter on Toolbar Manager to learn how to customize your toolbars. 3. In the graph interface, pull on the Bezier handle to adjust the velocity for all the selected functions. 4. To apply these easing parameters to a specific type of function only, such as Rotation or Scale, go to the Filters section and disable the function types you do not want to affect. 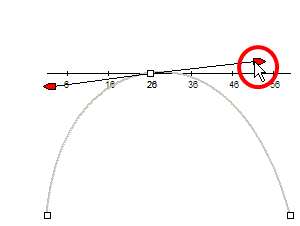 ‣ Rotation: If this option is enabled, the easing parameters will be applied to the selected Angle functions. ‣ Scale: If this option is enabled, the easing parameters will be applied to the selected Scale functions. ‣ Skew: If this option is enabled, the easing parameters will be applied to the selected Skew functions. ‣ Morphing: If this option is enabled, the easing parameters will be applied to the selected Morphing Velocity functions. 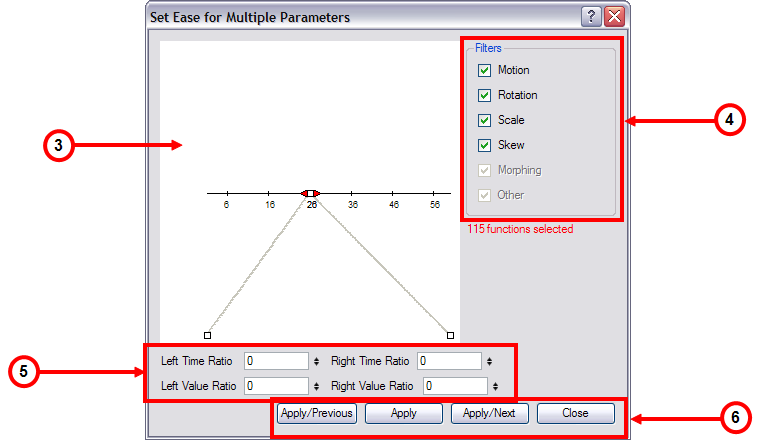 Note that it applies to the Morphing velocity function found in the Layer Properties dialog and not to the basic morphing ease in the Tool Properties view. ‣ Other: If this option is enabled, the easing parameters will be applied to all the other the selected functions such as all functions created to animate effect parameters. ‣ In the Left Time Ratio and Right Time Ratio fields, type the percentage value corresponding to the length of time you want the easing to last for. It is recommended to remain between 0% and 100%. If you go beyond 100%, your motion will overshoot. ‣ In the Left Value Ratio and Right Value Ratio fields, type the percentage value of how strong you want the easing out to be. It is recommended to remain between 0% and 100%. If you go beyond 100%, your motion will overshoot. ‣ Apply: This will apply the easing parameters to the selected keyframes. ‣ Apply/Previous: This will apply the easing parameters to the selected keyframes and then selects the previous keyframe in the timeline. ‣ Apply/Next: This will apply the easing parameters to the selected keyframes and then selects the next keyframe in the timeline. ‣ Close: This closes the dialog box. If you did not apply the modifications, they will be cancelled.